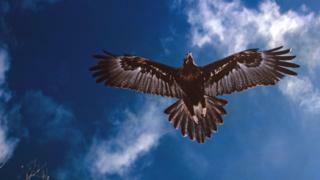 A man has been charged following the deaths of at least 137 wedge-tailed eagles in Victoria, Australia. Authorities found the animals – Australia’s largest bird of prey and a protected species – in April, prompting raids on several properties. The man is alleged to have used poisoned baits to kill eagles since October 2016. 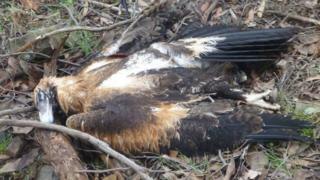 State officials described it as the largest case of suspected wedge-tailed eagle killings they had ever seen. Authorities have previously said that the true number of dead birds may be even bigger. Under the state’s Wildlife Act, killing a wedge-tailed eagle carries a fine of up to A$7,928 (£4,350; $5,700) and a maximum six-year jail term. Additional killings carry a fine of A$792 each. The carcasses were found hidden in scrub on properties that covered about 2,000 hectares in East Gippsland, the Department of Environment, Land, Water and Planning said. Authorities said the man was charged after an investigation involving about 30 people. They did not discuss a possible motive. He was released on bail following his arrest on Tuesday, authorities said. The Australian Broadcasting Corporation reported that wedge-tailed eagles had become a “a major topic of conversation” among farmers who say they attack lambs.